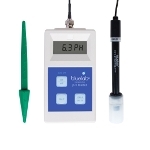 While our pocket pH meters are handy, portable and great at what they do, some customers find the slight loss in portability with the pH PRO to be outweighed by its reliability, accuracy and ruggedness. Shipped completely ready for operation, electrode and battery inclusive. Buffer solution not included.